Make Art That Sparkles! "Shimmer and Shine Workshop" introduces 30+ step-by-step art tutorials for adding a little (or a lot!) of shine to your mixed-media art. No matter what your experience level, you will love exploring numerous ways to use transfer foil, metallic inks, paints and other mediums as you explore projects for art journaling, gift-giving, home décor and more. Includes: Tips for getting more mileage from each sheet of transfer foil. Methods for working with and without heat. Techniques for creating on a variety of surfaces—paper, wood, fabric, glass and more. 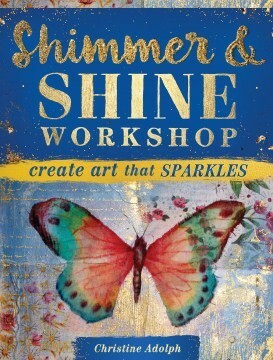 Learn how easy it is to let your art shine - Shimmer and Shine Workshop lights the way!